There is much to say about this book, but in the interest of not spoiling it for the reader, I’ll restrain myself. It’s 1987 and June Elbus is 14 years old. She and her older sister, Greta, are sitting for a portrait. Their uncle and renowned painter, Finn, is dying and wanted to paint his nieces before he was no longer able. Though his impending death is difficult for the whole family, it is particularly bleak for June. Finn is her godfather and together they are quite a pair. She’s an awkward girl who dreams of becoming a falconer and wishes she lived in Medieval times, while he is a misfit artist with an appreciation for all things quirky and unique. To be losing her only real friend is a heartache June cannot bear. It is only in the latter days does June learn that Finn is dying from AIDS, and though she has many questions on the matter, no one speaks of it at home. What unfolds is a secret, tender friendship between June and Finn’s partner. In their shared grief over Finn, June and Toby bring comfort to one another and ultimately learn that their connection is bigger than they realized and more important than ever. Time, for Toby, is short. Friends, this book is terrifically sad. However, it is worth the read because the subject matter is significant and worthwhile. On account of my age I was oblivious about AIDS and its related stigmas during the 80s, but as a high schooler in the late-90s, I became a Peer AIDS Educator through the local organization, Chattanooga Cares. Since then, I have carried a deep and abiding compassion for those effected by HIV/AIDS and am thrilled to have such a moving book to recommend to you on the matter. Tell the Wolves I’m Home is a poignant narrative that brings fear and love to the surface. It is frustrating and convicting, but it reminds us that a little compassion goes a long way. For more information about the novel and the images that inspired the author, go here. 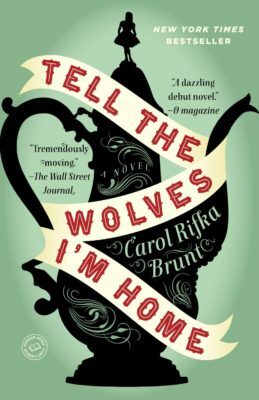 You can buy a copy of Tell the Wolves I’m Home here.